Tina Fey ('SNL', '30 Rock') and Amy Poehler ('Parks And Recreation') can certainly be considered dominant forces in US TV without ever quite scaling the same heights on the big screen. 'Sisters' (★★, 4/10) sees their comedic powers combine, with a screenplay by previous collaborator Paula Pell, under the direction of 'Pitch Perfect' helmer Jason Moore. Poehler and Fey play siblings who throw one last party at their childhood home, with obvious hijinks ensuing. 'Sisters' is a breezy watch, but its jokes feel tired and predictable (see 2011's 'Bridesmaids' for similar offerings, done better) and the ship is only steered away from disaster by the joy of watching Poehler and Fey work together. Writer-director Paul Weitz has an impressive CV, with an Oscar nomination for co-writing 2002's 'About A Boy' being perhaps the high point. 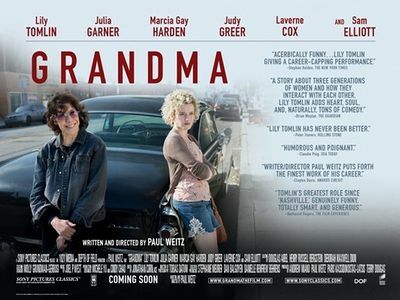 His form seemed to have dipped in recent years, however 'Grandma' (★★★½, 7/10) offers some of his best work yet - driven by a feisty performance by Lily Tomlin. Tomlin stars as Elle, who unexpectedly finds her teenage granddaughter (Julia Garner) turn up at her doorstep, needing money that Elle doesn't have. Weitz's amusing script is emboldened by a feisty turn by Tomlin, and there are shades of Alexander Payne's 'Nebraska'. Some further moments of emotional resonance would have been welcome, but the conclusion of a scene between Elle and her ex-husband offers one of the most powerful moments of cinema in 2015. Jeanie Findlay's music documentary 'Orion' recently picked up a British Independent Film Award for Best Documentary, and is available on BBC iPlayer for a very limited time. The story of Jimmy Ellis, who was bizarrely (and yet successfully) pushed as a beyond-the-grave version of Elvis Presley, 'Orion' doesn't quite share the quality of recent music docs like 'Amy' nor the mystique of 'Searching For Sugarman' but its investigation into music marketing feels oddly relevant. PIXELS / The short film from ONE MORE on Vimeo. The Golden Globe 2016 nominations have been announced, with 'Carol' leading the way on the film front, while the TV arena is tightly knit with the likes of 'Mr Robot' and 'Fargo' heading nominations.